Rhino News, etc. : ICD Uni Stuttgart Open Position: Tenure Track Professorship "Computing in Architecture"
ICD Uni Stuttgart Open Position: Tenure Track Professorship "Computing in Architecture"
Tenure Track Professorship "Computing in Architecture"
The Professorship (W1) with tenure track is dedicated to strengthening the link between architecture and computer science in research and teaching. 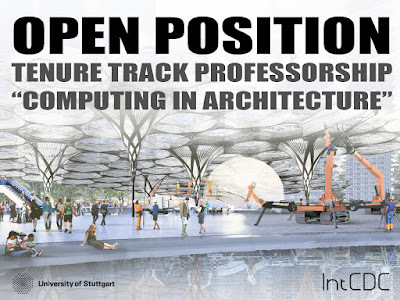 It is embedded in the various research activities of the Institute for Computational Design and Construction and the Cluster of Excellence IntCDC Integrative Computational Design and Construction for Architecture. Connections to the Department of Computer Science and the Cyber Valley Initiative are envisioned. The professorship’s research centers on the development and integration of computer science methods in computational design and digital construction, with a focus on the areas of machine learning and artificial intelligence.